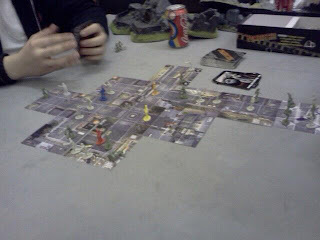 Confessions of a 40k addict: Gaming Night -Zombies!!! This week at my local friendly neighbourhood gaming club was it's busiest ever. 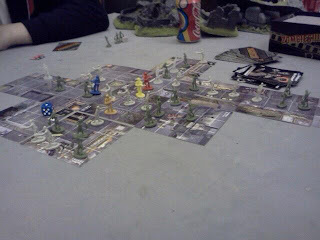 Only one table was playing 40k with the majority Warmachine, a Warhammer Fantasy Battle and one of Malifaux. I hoped the 40k battle was going to end quickly as it was only 1000pts but it was an introductory match to someone who hadn't played in 10 years. It was really interesting to watch though as the experienced guy really helped him through the rules and it seemed one of the most comprehensive explanations of the rules I've come across. In the end time was ticking on and I didn't really fancy a game once it turned 21:00. Good old PeteB finished his Malfaux nonsense [only because it made no sense to me whatsoever and at one point I was going to shout "numberwang" it was so convoluted] and suggested a game of Zombies!!! [please note three exclamation marks, you never need more than three dammit!!!]. I'd never played but my neighbour and car sharing buddy Mark was convinced it might take a while but joined in with Nathan, PeteB's Malifaux opponent. It's a simple game, you have a stack of 3x3 grid town tiles, some have numbers of Zombies!!! lives and bullets on. You start the game in the town square with 3 lives and 3 bullets. 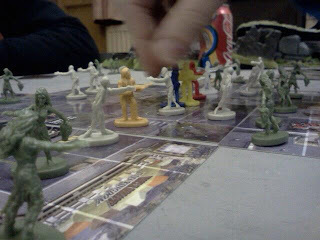 You draw a tile and place it next to another tile and populate it with Zombies!!! etc. Roll D6 and move, if you enter a square with a Zombie!!! roll D6, 4+ kills it. If you get a 3 or a 2 you can spend 1 or 2 bullets to take it out or lose a life and get a re-roll. The winner is either the person who kills 25 Zombies!!! or gets to the helipad. Throughout the game you also have cards that you can use. They're either situational - making Molotov Cocktails in the Gas Station or can be played any time - you get to move another player their D6 spaces. Of course this opened up wonderful opportunites to force Nathan, because lets face it he was the one on the receiving end of our naughtines ;) to plough through piles of Zombies!!! with only a couple of lives and bullets to save him. 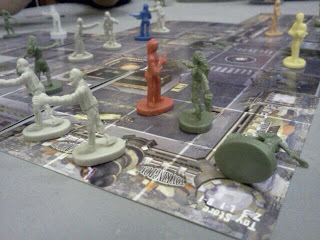 In the event of your death you go back to the town square, give up half your Zombies!!! but get your 3 lives+bullets back. This was such a laugh, unfortunately the above picture misses off the helipad just to the right, with 9 Zombies!!! in residence after those 8 lining the road in front of it. We had so much fun and the banter was hilarious, even my carefully honed Zombie!!! impressions went down well and much amusement was had by my constant movement rolls of less than 3 spaces. I think my little yellow guy was actually pretending to be a Zombie!!! like in Shaun of the Dead to save his a$$!